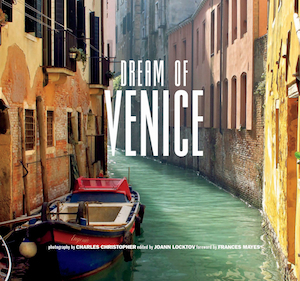 Dream of Venice delivers exactly what you want from a coffee table-type book — gorgeous photographs with just enough words to complement them as you page through, lingering on the images and phrases that speak most to you. I’ve flipped through this book probably ten times since receiving it, and each time, something else has called out to me . . . and always made me long for a weekend getaway to Venezia. The book offers various Venice scenes captured perfectly by photographer Charles Christopher, providing the reader natural, unique perspectives of the city. Images are in both black and white and color and depict vibrant daytime as well as the magical Venetian nights. Here everything and everyone floats. Not only the gondolas, launches, barges, vaporettos, and sandalos but also the buildings and the people float. One floats in and out of restaurants, shops, cinemas, theaters, museums, churches and hotels. One floats luxuriously with such a sense of freedom, never tormented by the traffic or even disturbed by the sound of a klaxon. Dream of Venice beautifully represents the soul of the city from its mysterious alleyways and winding canals to its humanity and vitality. And the quality of the book itself is simply superb. Any lover of Italy, especially Venice, would love a copy of this book. Highly, highly recommended. ** NOTE: I received a review copy of this book from the author; the opinions expressed are my own. The links in the post above are affiliate links, which means if you click on the link and purchase the item, I will receive an affiliate commission. To enter to win a copy of this gorgeous book, simply comment below with your best Venice memory or what you would most look forward to on a trip to Venice. I will choose a winner at random. Ends Wednesday, April 1 at midnight Italy time (no joke! ha!). Haven’t been to Venice yet, but look forward to floating around there soon! What a delicious thought! If I was able to go to Venice, I would go with my husband and take a romantic canal ride on a gondola. I would also want to walk the canal edge and see the variety of colorful buildings. There are so many sights to see in Venice, it’s hard to choose. Well as I have never been to Venice cannot say what it best. But for me would be the architecture, colours and shapes of buildings, Gelato. But most of all just being in Italy ???? My favorite memory of Venice was finding the Alta Acqua Libreria, which is the best bookstore in the entire world. It is everything you would want a bookstore in Italy to be, especially being tucked away from the “main” tourist areas. There are so many wonderful memories of my visits to Venice. Sitting in cafe florian drinking hot chocolate and eating very posh biscuits. Visiting the acadamia and being totally in awe of the wonderful art. Listening to montiverdi vespers on my I-pod while sitting near his grave in the frari, while just taking in the beauty of the stained glass windows etc. My Venice — a world where sounds drift through my thoughts, my memories, my senses. When I dream, I dream of Venice. Venice is never far from my thoughts. I am reminded of its beauty and exceptionality daily when I look over at the beautiful Venetian glass mirror, I purchased on my last trip. It holds pride of place on my bureau. Elegant and exquisite, like La Serenissima itself. Venice, the ultimate dream destination. I am going there for my 40th wedding anniversary in June, I have had my 30th, 40th, 50th & 60th birthdays there. My daughter married there. I have had my Silver Wedding there. Venice belongs to us all, Venice is mine, Venice is a dream come true, the most dreamlike place ever…………. I went to Venice several years ago wearing a different hat, not so much as a tourist but to visit the Biennale. My memories are of heat, people, wonderful food, and of course, the Biennale. And this: I had booked into a room not far from St Mark’s Square, and made careful note of what was on each of the corners I passed as I left my accommodation. When I returned late that night I seemed to be walking far too far down dark narrow alleyways, getting increasingly nervous as I went. I retraced my steps, and eventually found my street. All the permanent-looking shops I had chosen as landmarks had simply disappeared for the night, changing the face of the streets completely! I arrived at the train station… and spent 30 minutes procrastinating (buying a plane ticket etc) because I knew there was going to be some kind of major emotional reaction. When I finally walking out the doors down to catch the vaporetto a big gasp that was almost a sob escaped. The most amazing deja vu ever. And I hadn’t been there before – in this lifetime. Maybe it was then that I realised that Italy is home. And now it is. I’ve been lucky enough to visit Venice twice. Got lost once. 🙂 Almost ran into a guy as tall as I am (6′-4″) coming around a corner wearing a pink tutu and black Converse sneakers. Strange. Very strange. Hope to make Venice again some day. I’ve never been to Venice, but I would SO love to go. I have this dream of walking the squares with my incredible husband and showing off all of the art and history to my incredibly curious daughter. There is so much there that I’d love to see and do (and EAT!). I have never visited Venice. But if I would have the possibility I would take a boat and admire all the beautiful houses and bridges. I spent two and a half years in the U.S. Army stationed in Vicenza. I loved my weekend trips to Venezia.When I would walk from the train station through the winding back alleys to Piazza San Marco, the hair on the back of my neck would stand up. All I could think was, I am following the foot steps of Marco Polo! I loved sitting in an open air bar in the early evening, sipping a glass of tasty wine and listening to the orchestra play, “I left my heart in San Francisco.” Venezia is magical. One cannot help but fall in love with the most romantic city in the world! I certainly did and I left my heart there! Venice is one of 🙂 the most unique and romantic cities in Italy! I never tire of walking the narrow paths to reach St. Marks square! Dreaming everyday to return and experience Venice all over again. It would take a lifetime to discover all of this cities mysteries, but one I would gladly give! Oh oh oh. Venice. I have so many lovely memories but to spare everyone I will choose the day I became lost (as one should) & poked around old shops, markets. I was only 18, it was November & I was feeling a bit sad that day. For long boring reasons. Anyway, I focused on trying to find a gift for my mother that I could afford & still eat for another week. I found a lovely printed old map & spoke in Fritalian with the very lovely owner. No doubt he gave me a tremendous discount as I recounted looking for something for mama. It was one of many encounters with Italians that I shall never forget. It was played out over many years with many others in many other cities. I have always been treated so well by Italians when I have visited. No doubt that I am not alone in this comment. I know that some take advantage but honestly? I have never had that experience. We are a family of 4 – kids are 13 and 10. We are looking forward to walking the streets, smelling the atmosphere and riding the canals. Also looking forward to the glass blowing and the food. Venice is always where we fly into when visiting Italy. Taking the vaporetta in to Venice from the airport is always the best way to come to town as the anticipation builds the closer you get to the doc. We love to get up early before the tourists & just wander with the locals. It’s so freeing. This is our favorite city in all of Italy. Best memory of Venice is riding in a gondola. I loved being enveloped in Venice’s gentle, changing illumination; the interplay of light, colours and reflections. Venice…my “back yard” for 12 years…how I miss your smells, your sunny piazzas to sit and have a prosecco, your colors, your zigzag narrow pathways, your life. Florida just doesn’t compare. I miss you so much! I’ll be in Venice at the end of April. Looking forward to tasting the coffee, the cicchetti, the wine; to inhaling the aromas; to imprinting the sights and sounds on my brain, which has dreamed of them all for decades. Looking forward to finding the locals and their favorite places to eat cicchetti!! My wife and I spent some time in Venice just recently and we loved two things: getting lost and singing gondoliers. We had a hotel off the beaten path on a well-frequented canal and one of my favorite memories was sitting by the window of our hotel room, listening to the gondoliers serenade their guests. Che posso dire? Son Vicentina e percio’ Veneta. Death under the Venice Moon was my last release from Gemma Halliday Publishing. Yes, I love Venezia, i miss it every day, every minute and by the way, I have dual citizenship. That’s it, going to cry into my polenta e baccala’. Ciao. My most favorite memory of Venezia was relaxing at a small cafe sipping a delightful Limoncello with 2 companions, while gazing across Le Canale Grande watching a few gondole glide by against a breathtaking sunset! Ah, to repeat that experience would truly be serendipity! Ti amo! Bellissima! For me I left my heart in Venice.Truly my love I cannot wait to go back ! La Serenissima mi chiama! I long to answer! One of my best memories of Venice is maybe the second or third time a bunch of us were there and everyone had stayed in, either they were tired or just want to take a down day, and I didn’t and I walked around by myself. I had a coffee in St. Mark’s Square and found a beautiful little leather shop where I bought a pouch for my rosary and went to an art exhibit by myself. I went to La Fenice and took the tour and had another coffee and then went to two more art exhibits and later finally found the little shop where the women prisoners sell tote bags and clothes they made. I remember just having a really wonderful time walking around by myself and really just taking it all in. I’m sure I had a gelato in there somewhere!!! The light, the reflections, the colors, the whole sensory enlightenment was not all I came to explore in Venice. My cousin used to be the chief Rabbi of Venice, and I wanted to know whatever I could about this original ghetto. I was not disappointed. That 5 synagogues existed in such a small space baffled me, and there was so much more I wanted to know about than just one visit could provide. If I could afford it, I would return for an extended period just to immerse myself in the history and beauty of this magical place. My late arrival (by train) was rewarded with an unforgettable sight of Venice at night. 2nd best memory – being serenaded on a solo gondola ride and holding a parasol, making me the subject of many a passing photographer! A truly magical unique city. I have traveled far and wide but have not visited Venice.. yet. My brother, who has stage IV cancer, chose Venice as his dream destination. I want to travel to Venice and see what my brother saw. a deep bond with him. I want to travel, however briefly, on the same path as him. To take in all the beauty of Venice. The city has a beautiful soul. which makes it even more precious. Off to Venice for the first time in three weeks. Getting ready by watching Francesco’s Venice and reading Donna Leon’s Commissario Brunetti novels. I’ve been twice, and I’m going back again this May! Getting lost in the streets, crab gnocchi in St Marks piazza, seeing the Rialto bridge for the first time, buying my first cameo from Eredi Jovon, I can’t possibly choose just one!! Getting lost in Venice is the best thing to do. There is a surprise around every corner. I was fortunate enough to visit Venice 10 years ago. It has “haunted” me ever since. It’s the most magical place I’ve been to so far! My best memory happened on the island of Burano. I was part of a tour group at the time and was itching for my own experience. I took a wrong turn (on purpose) leaving the group behind. Within a few steps a little Venetian woman sat in her doorway, crocheting tiny lace butterflies. She let us snap a picture of her selling her wares…so precious! Of course, I bought a butterfly from her and smile whenever I glance at it. I love to be able to have that connection with people from other countries! I was in venice in 2012. We took part in a walking tpur. Venice is the most amazing alluring romantic mysterious beautiful place to be. July 2010 – listening to the Calgary Girls Choir sing in the exquisite Chiesa degli Scalzi. Ididnt see much else of Venice that trip, I need to return to make her acquaintance properly. My [blow]pipe dream is to have pots of money to hire some of the best Murano glass blowers to make me a solarium out of their magical, fanciful glass. Best of all I’d be there, watching the entire process that turns some dusty, gritty stuff into tapestries of richness that equals Venice’s ancient, opulent fabrics. Which would be next on my list. And be revived by espresso and frittole – aaaah, bliss and Paradise! One year, my first stop was Venice. I woke that first morning before dawn due to jet lag. I decided to head on over to Piazza San Marco. I almost stepped on a RAT! on the way because I was out and about before the street cleaners started their day. I arrived to an empty Piazza San Marco. There were only two or three other people there for at least 30 minutes. It was incredible! The lighting, the peacefulness, the openness, the grandness of the piazza. I have never been able to recreate that day. I dream of just being there, taking long walks and going on a gondolier. I’ve never been, but that is truly, my number one place to visit in the world. I’m going when I retire.